Being stung by a wasp, hornet or bee is a painful experience and can be life threatening to the one in thirty people who are allergic to stings. 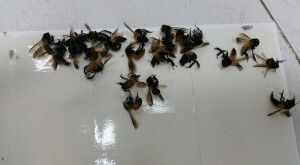 However, it is possible to reduce these risks by taking sensible precautions when outdoors and ensuring that wasp or bee nests are properly managed or dealt with. Take care when dealing with wasps and hornets (a larger member of the wasp family) – they have a potent sting and can attack in large numbers if disturbed. If you are experiencing high numbers of wasps in your home or garden it is likely that there is a wasp nest nearby. A single nest may contain thousands of wasps which can swarm and attack if disturbed. If the location of a wasp nest is likely to put people at risk, then the nest should be destroyed. The nest is made from chewed wood that gives them their distinctive papery walls. A queen wasp will start to build a nest in the spring but then as workers hatch they take over nest building. A typical wasp nest will be 30cm across although they can be much larger. Common sites for a wasp nest include under the roof eaves, in lofts or in sheds and out-buildings. To locate the nest, watch the flight path of returning wasps. If the nest is the near the home, keep nearby windows closed. If you suspect the nest is in the loft, take great care in opening and entering the loft space. Bees are less aggressive than wasps and much less likely to sting. 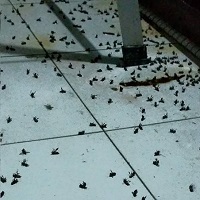 Furthermore, since bees are highly beneficial to the environment and some species are under threat, bees should not be killed and nests should be left undisturbed whenever possible. 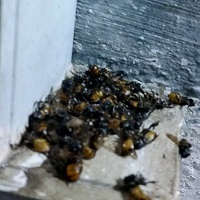 If a bee nest represents a high risk (such as a nest in the home or a hospital or near those who are allergic to bee stings), the nest can be moved to a safe area. Hornet is recognized by its shiny black coloured body, with yellow-banded abdominal segments. In contrast, a bee’s body is fuzzier with a distinctive pollen-collecting basket (basitarsus) on each hind leg. The wasp is a solitary insect and like the hornet, is thin waisted. The hornet’s nest is an intricate work of art and engineering. It is made of wood which the hornet chews from tree trunks, grass stems, unpainted fence posts, cardboard boxes and dried-out weeds, and converts into a pulpy mass (like papier-mache) by its salivary secretion. This is lighter than the mud nests of solitary wasps or the wax hives of social bees, and is just as hardy. A hornet’s nest has a characteristic pattern and is multistorey; each floor is suspended from the one above on stiff paper ropes. Do not suddenly swat at bees, hornets or wasps flying around you. If they turn out to be hornets, which you had mistakenly thought to be bees or wasps, you will provoke them into attacking you. Do not shine torchlight directly into a hornet’s nest at night because its residents will be attracted to the brightest light source and attack. If under attack, retreat as fast as possible. If retreat is not possible, lie face down as still as you can and cover your head with your arms. lf available, dive into a pool of water and stay submerge as long as possible or necessary.Do not wear bright, flowery clothing or shining jewelry/buckles when moving in shrubs or thick vegetation in the countryside. Do not wear bright, flowery clothing or shining jewelry/buckles when moving in shrubs or thick vegetation in the countryside.